We will bring you back, to the same place, you were picked up from the beggining. There was a lot of wasted time. Shuttle to the visitor centre to wait for a bus to take us to Tulum took 2 hours. Lots of waiting around and unclear instructions. Visit to Tulum was good and the beach was very nice! Back on the bus to go BACK to the visitor centre for lunch was not what we expected. Back on the bus to go to Coba was fine, smaller group. 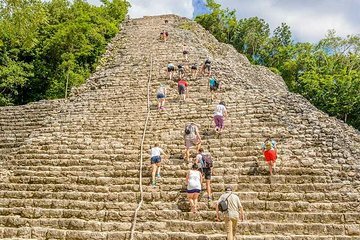 Coba was a great experience but certainly weren't given very much time in the area. The tour guides were great and very knowledgeable. I wasn't expecting to spend so much time going back and forth to the visitor centre which was disappointing. I understand they are trying to keep everyone organized and safe but I wouldn't do this tour again. If I had a "re-do", I'd spend more money on a small group trip that gives more time in the different areas.